Galaxy S4 is an awesome phone made by Samsung. So, today we are going to Install Philz (touch) Custom Recovery on Galaxy S4 GT-I9500. Galaxy S4 was released in March, 2013 and it got so much success. The reason for its success was its new improved design, hardware and it famous features like air gestures. But as time goes by new phones emerges and there is need to customize our phone to compete with the new latest phones. So, for customizing a phone, like installing custom roms, backing up the data, overclocking the CPU etc is only possible if you have a custom recovery on your phone. Custom recovery is different form ordinary stock recovery of Android. A Custom Recovery has many abilities, it can flash a custom roms, install zip files and it can create a full device backup including all the data, apps and software. 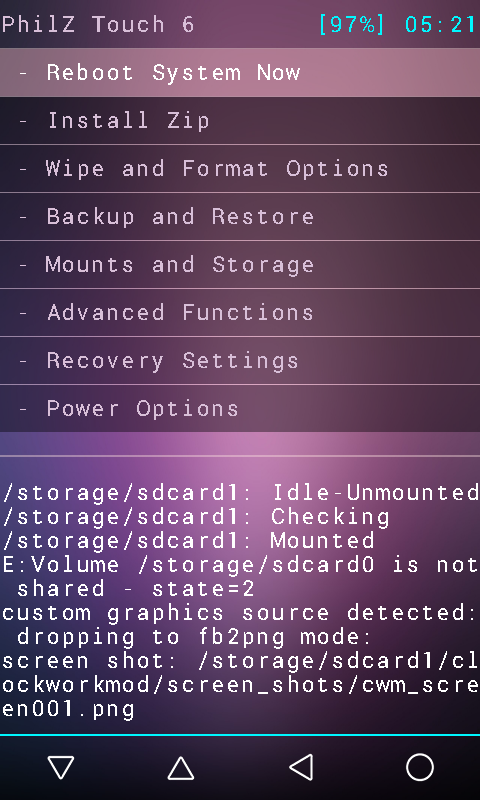 So, if you are an Android geek you should have Custom recovery on your phone. Also there are many custom roms through which we can update our phones to the newest version of software and Custom Recovery is must for installing a custom rom. So, guys, get ready to install philz recovery on your Galaxy S4. The process is easy but requires full attention. I will make it as easy as possible so that you get all the detail you want. The procedure to Install Philz (touch) Custom Recovery on Galaxy S4 GT-I9100 is given below. Follow all the instructions carefully. Also read the disclaimer. So, prepare yourself and follow the procedure below. Philz recovery is a CWM based recovery or you can say that is an advance version of CWM Recovery. It is a Custom recovery designed for Android phones for handling the Custom Operations that are impossible to do with a stock Android 3e recovery. Always remember that this process is unofficial and it will void your phone’s warranty and trip the KNOX counter of your Galaxy S4. So let us start to Install Philz (touch) Custom Recovery on Galaxy S4 GT-I9500. If your Galaxy S4 is not rooted then you can root your phone by following the link below. The following method is applicable only for Galaxy S4 model no GT-I9500. Do not try this on any other model. You should not do this if you are completely unaware of this process. So, try this only at your risk. If something wrong happens with your phone then Droidopinions.com will not be held responsible. This is an unofficial process and it will void your phone’s warranty, Thanks. 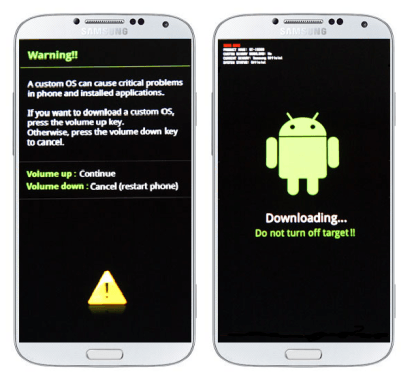 In order to Install Philz (touch) Custom Recovery on Galaxy S4 GT-I9500 there are some precautions you have to take. Confirm the model of your phone by going to Settings>>About Phone>>Model NO make sure that it is GT-I9500 then proceed. Backup all your important data like conatcs, sms, photos, videos etc to avoid data loss in case of some problem if occurs during the process. Charge your phone above 55% to avoid power loss during the process. Down load the Philz touch recovery on your computer. Now download the Odin v3.09 and extract it. On your phone go to the Settings>>Developer Options>>USB Debugging Mode and enable the USB debugging mode. If you do not find Developer Options then you have to activate them by going to Settings>>About Phone and tap on Build No seven times. After that turn off your phone. While you phone turned off, enter into download mode by pressing and holding Home+Volume Down+Power buttons for a few seconds until a warning screen appears. From there press the Volume Up button to confirm the task. Now launch the Odin on your computer that you have downloaded and extracted in the first step. Connect your Galaxy S4 to the computer. The ID:COM box in the odin will turn blue if the connection established successfully. In Odin click on PA/PDA option and select the philz_touch_6.12.8-i9500.tar.md5 that you have downloaded. Make sure that Auto Reboot and F.Reset Time options are enabled (checked) in Odin. Check the whole process again for any faults or errors. After you have rechecked all the process, click on the Start to begin the process. The Odin will start flashing the recovery on your device. I would take a few minutes to complete the process. After the process complete, a PASS message will be shown on the Odin’s screen. After the PASS message appears, your device will automatically reboot, wait for sometime and disconnect the cable when you see the home screen. Congratulations to all !! you have installed the philz custom recovery on your phone. Now you can install custom roms on your phone, flash zip files, create backups and much more on your Galaxy S4. Hope you succeeded in the process. Comment if you have any problem. You can check your new recovery by booting in to recovery mode. For doing this follow the instructions below. Press Home+Volume Up+Power button for few seconds until the recovery mode appears. By doing the above method you can boot into recovery and checkout the new Philz touch recovery. There are different options for different purposes. Now select the Reboot System Now option if you would like to get out of the recovery mode. So, that was it, time to go.// Bye !! Please like, share and subscribe. Comment below and share your thoughts with us.